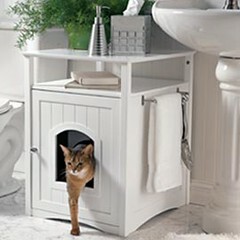 If you want to hide your cat’s litter box in style, you can get a Kitty Washroom cabinet that disguises your litter box. It has a hole for your cat to go in and out, shelves for extra storage, and a door for easy accessibility. Your guests won’t even know that you have a cat. This entry was posted on Friday, May 11th, 2007 at 3:51 am	and is filed under Cats, National Dog, Cat & Pet Info, Products & Services for Cats & Dogs. You can follow any responses to this entry through the RSS 2.0 feed. Both comments and pings are currently closed. I love that too! I want one. I love that! I want one too. Pretty cool…..but look where it’s made - (click on “The Facts” tab) - AUGH!!!! That is so cool, but I have too many litterboxes to hide! Made of MDF - is that Melamine-Dense Fiber? I couldn’t access the web site. Anonymous are you trying to tell us it is made in China? In that case ignore my previous post!